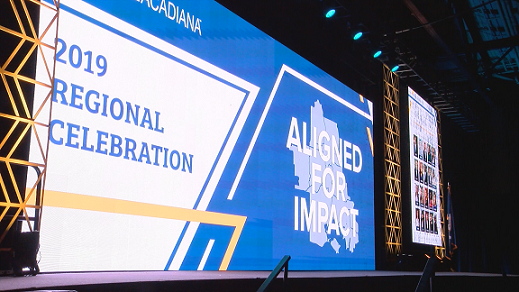 Hundreds of business-minded people gathered at the Cajundome for One Acadiana’s Regional Celebration. The celebration is all about networking, and putting a spotlight on local economic development and what’s next for the region. “it’s not just about attracting new companies to come to your area. it’s about taking care of the companies that are already here.” said One Acadiana CEO Troy Wayman. Wayman says one of the organization’s proudest accomplishments are the efforts of the business retention and expansion program. “It’s a matter of being face to face with them. we do well over 200 of visits a year. we’re in the offices, talking to those companies, finding out what they need to be successful because we want to help them prosper.” said Wayman. Cox Communications helped Nunu’s Fresh Market improve its customer service. “At cox, we understand that it is small family businesses just like yours are the very fabric of what make Acadiana so great and why we partner with One Acadiana to promote a healthy business climate.” said Joan Dubuisson of Cox. Wayman believes they will only build their success of 2018. “I think its important to realize that there are a lot of positive things happening in Acadiana. we aren’t not hiding from any of the challenges we face going into this year. we want to celebrate the good things happening in 2018.” said Wayman.